On top of the 3 ModWraps for FREE promotion, they are offering a FREE surprise ModWrap bracelet when you purchase using our coupon code between Black Friday and Cyber Monday (Nov. 28th - Dec. 1st). New customers can get three (3) FREE ModWrap bracelets, all you have to cover is the shipping! 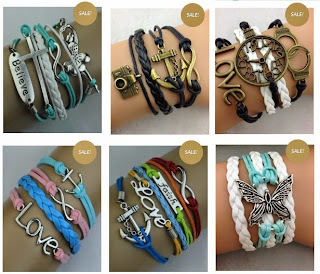 There are over 60 bracelet designs to choose from! Want more than 3 ModWraps? You can even stack the coupon with their current deal and get each additional bracelet, after the first three, for only $3.95 (instead of $15.00) with no additional shipping charges. This deal is way too good to pass up, so get your FREE bracelets NOW!